I've been doing some knotwork recently. Jaco named them Bob. 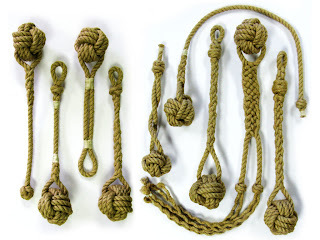 They are monkey's fist knots with splices, whippings, seizings, wall, double wall and crown, Matthew Walker, and double Matthew Walker knots. For self defense, the visiting tom cat and other interesting uses.